What’s coming soon at Chelle-Chelle.com! So much has changed since I last posted here! Since May 10th, I’ve started work full time (temporarily until September when school starts again). 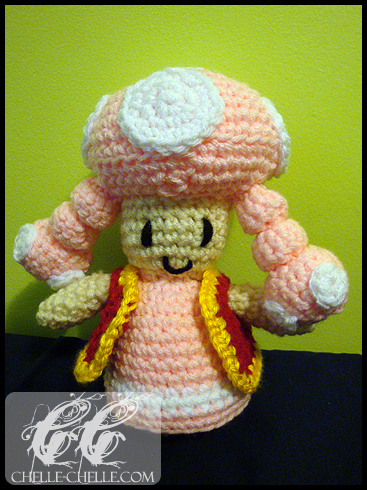 Toadette is currently sitting on my desk at work and has her hands on the highlighters that I use. I also participated in another handmade Blythe swap (theme was ‘geekcraft’!) and right now I’m working on a few new patterns to share! The first pattern is an infant/child hat pattern – it will be available in three sizes and so far I’ve got two of the hat sizes all figured out. I’m still working on the last prototype hat before I get the hats tried out on people who are appropriately aged for them. I’m hoping to get the pattern finalized and up on the site before the end of the month! The next project I’d like to mention is that I’m working on is a sampler stitch scarf for beginning crocheters who want practice with all the different stitches that there are for crochet (i.e. single, half-double, double, triple) all in one scarf! It’s looking pretty good so far and that pattern should be made available by early to mid July. The last/third pattern that I’ve been working on is a little monster! I’m really excited about this one because he’s super cute and will be the star in part 2 of the upcoming article all about eyes for amigurumi! The pattern for my little monster should be available by early to mid July as well. My first adventures with fulling (or better known as felting, even if it’s technically not the proper term)! The yarn I used was Nashua Wooly Stripes. This yarn is 100% wool worsted weight and the colour is WS14 Blackened Jade. I used a 5.50mm hook (US I9) for this project and the pattern was one of my own (i.e. I made it up as I went along). 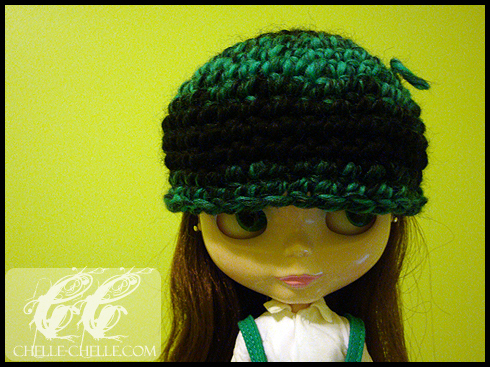 This pattern was inspired by Lisa at q.D.PaToOtieS‘ Blythe Brain Sucking Monster Hat. I saw the image and never saved the pattern and then when I went to find it, I couldn’t! 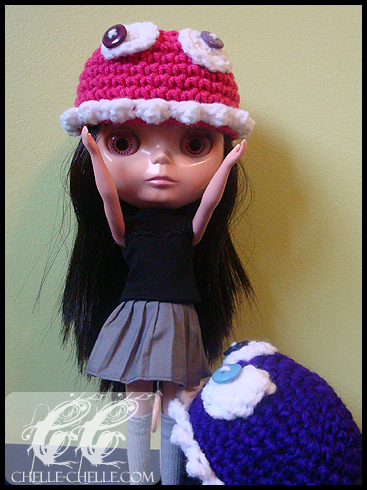 So I came up with my own way of putting together the monster hat (and shortly after I completed my first Blythe Monster Hat, I found the original pattern by Lisa). Size: Fits Blythe dolls (does not fit Petite Blythe). 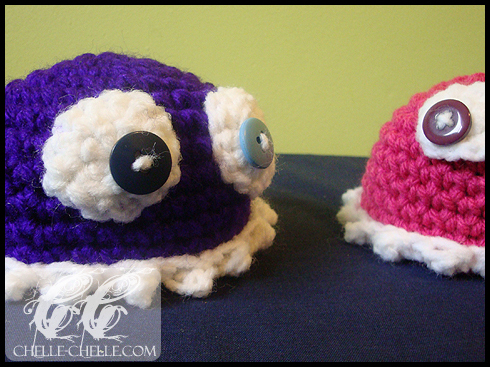 For the purple hat, I used Red Heart Super Saver (purple, white) for both colours. For the pink hat, I used Bernat Super Value (pink) and Red Heart Super Saver (white). 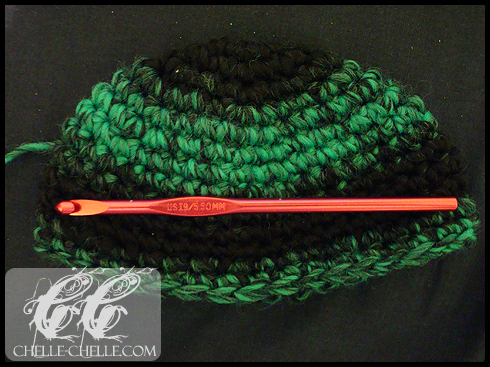 You need to know how to increase with single crochet stitches and how to do the magic ring. Number of stitches listed at the end of the row in the parentheses. Pattern is worked in the round (not joined at the end of each round) – use stitch markers to help with counting. Round 1: In MC, crochet 6 sc in a magic ring (6). Round 2: *2 sc in next st* repeat 6 (12). Round 3: *sc 1, 2 sc in next st* repeat 6 (18). Round 4: *sc 2, 2 sc in next st* repeat 6 (24). Round 5: *sc 3, 2 sc in next st* repeat 6 (30). Round 6: *sc 4, 2 sc in next st* repeat 6 (36). Round 7-12: Work even in sc (36). Round 13: With CC, ss each st around (36). Round 14: *sc 1, 1 tr* repeat 18 (36). Fasten off, tuck in ends. Round 1: In CC, crochet 6 sc in a magic ring (6). Attach buttons to eyes prior to attachment to hat. 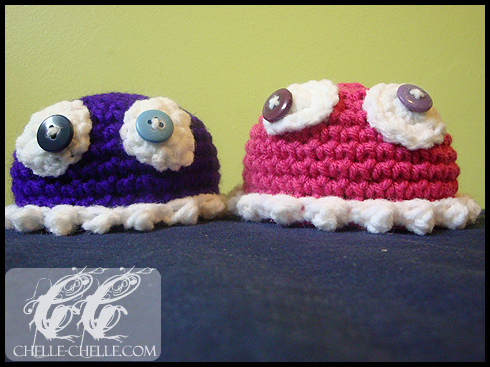 For a fun look, have the buttons looking in opposite directions or have the monster be cross-eyed. This pattern is an original pattern by Michelle W. (March 2010). Please do not claim this pattern as your own. If you wish to share this pattern, you may link to this pattern but do not sell or otherwise distribute it. Items made from this pattern may not be sold as the pattern is for personal use only. Please contact me via my website http://chelle-chelle.com if you have any questions, comments or concerns.